Smart technology seems to have permeated every market imaginable, and the kitchen is no exception. Smart devices now litter the modern home. But just when you think you’ve seen every gadget possible, something new and exciting springs up. While these gems are getting harder to find in the sea of smart devices that are flooding the market, they do exist. Here’s some kitchen tech that we desperately want to get our hands on. Revealed way back in 2014 at the International Consumer Electronics Show, this cool piece of tech blends the physical with the virtual. The cooktop can recognize and apply heat to areas where you place your pots, allowing for some real flexibility. Want to make sure you’re following on track with the recipe? No problem, just pull it up on the cooktop. After you’re done, share it to Facebook with a simple touch. The only downside is that we will have to wait until 2020 for this tech to become available. JuneOven has really taken oven technology to a new height. Activating your oven on the go from your phone? Been there, done that. How about a camera that identifies food & suggests the optimal cooking presets? Or, an internal thermometer that guarantees food is cooked just how you like it without ever having to open the oven. Now we’re talking my language. With so many gadgets claiming to save time, it’s great to see one that steps up. According to the FAO, we waste roughly one third of our food. If you have a fridge lined with leftovers, you can easily lose track of everything. DaysAgo is a handy little device helps by keeping track of how many days it has been since you last opened that jam. It’s a pretty simple concept, but it can really speak volumes to just how much we let go to waste each year. It’s expensive, yes, but Samsung’s Smart Fridge is a sign of trends to come. It comes loaded with all the standard apps – Internet, shopping list, but does it all oh-so well. The large touchscreen is very easy to use and each app is very polished. By far the coolest feature is the ability to manage various settings of the fridge like temperature. If you want to change one portion of the fridge from freezer to refrigerator, you can do so with a simple touch. And just like Tesla’s Model S gave way to the more affordable Model 3, I hope that this fridge tech will pave the way for more affordable, cooler tech. Somabar is an app-controlled bartender that will mix your cocktails for you; does it get any better than that? Just select the drink you want from your app, add in the ingredients and watch as your own robot bartender dispenses your perfectly-crafted drink. It’s no surprise that an Amazon product is on this list. Amazon has been making great strides in the last few years to really integrate itself in the home. The Dash Wand allows you to scan items and add them to a shopping list. But want to know the best part? If you use the food service which Amazon provides, you will receive 20 dollars of free credit by buying this device. Since the Dash Wand only costs 20 dollars to begin with, you can immediately make your money back! And because it is Amazon we’re talking about here, you will get Alexa integration so that you can order the groceries you’ve scanned with just your voice. Diahann Young is the Director of Digital Platforms and Innovation at Pulte Homes, one of the largest home builders in Florida and the United States. She specializes in discovering innovative ways of developing products for home building. Her role with Pulte has strengthened her passion for homes, design and all things real estate. 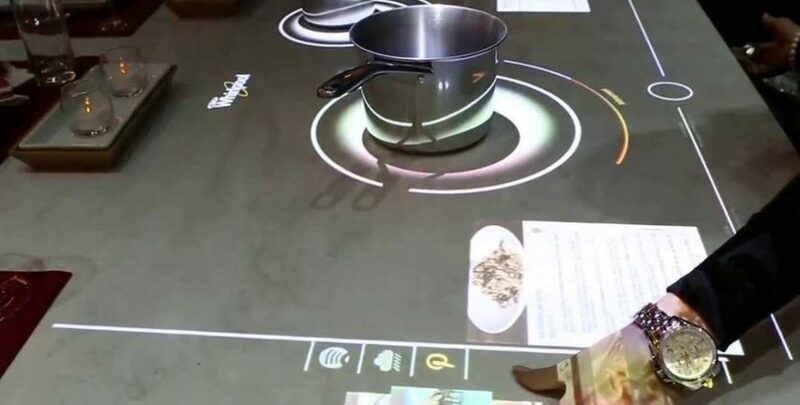 The interactive cooktop is definitely the gadget of the future for kitchen. A couple of more years probably now, worth the wait. Nice article. Simple and conversational language that makes everyone understand.